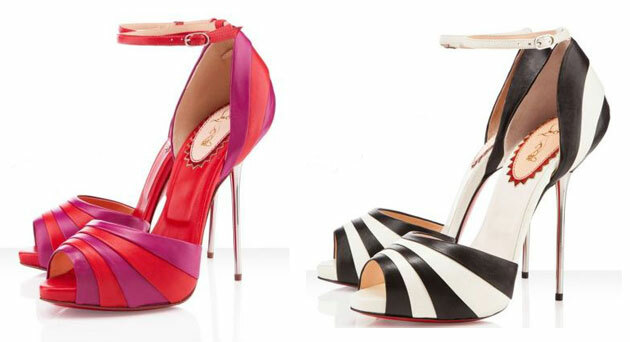 These shoes are from Christian Louboutin’s 20th anniversary collection, and I woudn’t mind “collecting” both of them, although if I had to choose, the black and white version would win hands (feet?) down: they’re bold, but in an easy-to-wear way, and I think I’d get bored with red and purple much faster than with black and white. Which I can’t really imagine ever getting bored with, to be honest. I know many of you will dislike the pin heel on these, but I think it lends itself to this particular style, in a way that a thicker heel wouldn’t. 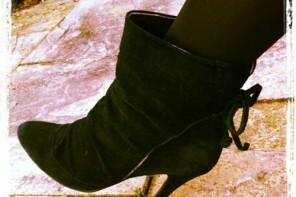 I even like the ankle strap, which isn’t something I often find myself saying. As these are a collectors item (and just because they’re Louboutin), they’re obviously not going to be cheap, however: you can buy them at the Christian Louboutin website for $1,195. I kind of like the pink and red ones! But you’re right about getting more wear out of the black and white version. However, since it’s all hypothetical, I’ll take both!